Tuvalu, a small island nation located in the Pacific Ocean, is comprised of 9 atolls and islands of low and flat grounds with a highest elevation of about 3 meters. These low-lying islands are believed to be under threat of sinking due to the rising sea level associated with the recent global warming. Meanwhile, we are also beginning to learn that the danger of sinking is becoming even greater as local issues, such as rising population and economic growth, combined with the effects of the rising sea level. To tackle this issue, we must first develop a plan to counter the rise in sea level based on an understanding of how the islands are able to produce, transport, and accumulate sand sedimentation. On top of this, we must also address the various adjoining problems so that the islands will be rehabilitated to withstand the potential threats from the rising sea level. Main area of Fongafale Island. As many as about 5000 people live on this island of only one square kilometer. With the increase in population, people have begun setting up residence in low-lying marshlands. 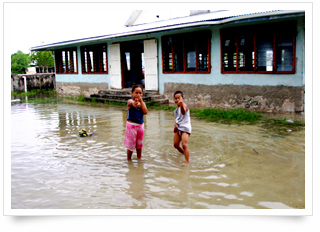 At king tide (when the tide is at its highest level in the year), seawater floods the area in front of Fongafale Island's meeting hall. The island's meeting hall area has traditionally been located on a low-lying marshland, and is known to have also been flooded with seawater 100 years ago. Graduate degree from the Graduate School of Science, The University of Tokyo. Appointed Researcher / Chief Researcher at the Marine Geology Department, Geological Survey of Japan, Agency of Industrial Science and Technology, Ministry of International Trade and Industry. Appointed Associate Professor at The University of Tokyo in 1995, where he currently serves as Professor from 2007. His research at the graduate school focuses on the response of coral reefs to global warming. Graduated from the University of South Pacific (environmental studies). Appointed Research Assistant on Health at the Health Department of the Ministry of Health, followed by being appointed Advisor at the Environment Department in the Ministry of Natural Resources, Energy and Environment. Appointed his current position in 2000. Responsible for participating in and negotiating at international environmental conferences, as well as organizing awareness programs to gain the attention of the media. 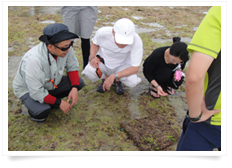 Foraminifera research is rare in the world, and its cultivation is a first such attempt worldwide. If we can achieve results through this project, Japan will be able to provide assistance on problems related to the rising sea level that is expected to emerge in various parts of the world. Not only that, but the project is also important for Japan itself. Japan is also an island nation, so if such places as Okinotorishima Island should face the danger of sinking in the future, Japan would be able to take a key role in managing the situation. Tuvalu has been calling for international assistance, as the sinking of the islands is believed to have already begun due to the rising sea level from global warming. In previous years, we have been taking a passive stance in waiting for assistance, but in recent years, we have begun feeling the need to protect and develop our islands from a long-term perspective on our own efforts. And so, with the assistance of Japan, we have started strengthening our national land formation capabilities through natural means. One of these methods is through foraminifera sand, which has historically formed our lands over many years. In this way, we aim to become a nation with high rehabilitative abilities that can sustain the islands for a long period of time. A specimen that has grown large through cultivation. 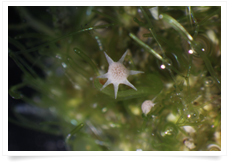 When alive, star sands live by attaching themselves to things like kelp, so a similar living environment must be provided when in cultivation. Star sand is a type of protozoa (Note 1) called foraminifera that develops a star-shaped calcareous shell. When it dies, the shell becomes sand. Two-thirds of the land of Tuvalu is actually made up of these foraminifera sand. And so, the aim of this project is to cultivate foraminifera in order to increase sand production, thereby restoring the islands' natural abilities to deal with the rising sea level. The project's main areas of research are the following: 1) biological research to find out what the environmental conditions are for increasing foraminifera; and 2) marine engineering research to develop an effective system for sand transportation based on an understanding of how the ocean currents surrounding the islands affect sand transportation and sedimentation. Note 1: A group in the animal world, with the subcategories of Flagellate (Euglena), Sarcodina (amoeba), Sporozoa (causal agent of malaria), and Ciliata (paramecium). An experiment on the seashore to create a new habitat for foraminifera. Checking to see the level of foraminifera fixation. Countermeasures are being developed that make the maximum use of the islands' natural capabilities. Specifically, foraminifera are cultivated in a tank while testing the best conditions for its growth, and then, these foraminifera are attached onto artificial kelp-type mats and planted into the seashore to create a new habitat. Efforts are also being made to estimate the amount of annual sand production by using the foraminifera habitat distribution map developed through satellite images acquired from remote sensing (Note 2) technology. Note 2: A technology to remotely observe the Earth's surface. What motivated you to study corals and foraminifera in Tuvalu? I was inspired when I visited Tuvalu and saw an orange-colored island made of foraminifera shells. I thought to myself, "we can protect Tuvalu with foraminifera!" The beaches on Fuakea Island are made from orange and white grains as seen here. The orange grains are star sand shells. The white grains are white foraminifera shells as well as fragments of corals and shells. Fuakea Island made from foraminifera sand. The Funafuti atoll in Tuvalu is made up of a chain of many small islands. One of these islands is Fuakea, which is made from sedimentation of foraminifera shells. The shells are tinged with orange, so the island looks orange from afar. Put into a few words, what do coral reefs mean to you? If you were to summarize the local character of Tuvalu, how would you describe it? Most of the people are easy-going and laid-back. They have a strong tendency to look at everything optimistically, so not many people have a sense of crisis on the problems facing the islands. So I think it is important to use education as a means to make the people of Tuvalu aware of the current situation of their islands. Mid-term evaluations for the project were conducted in September, 2011. How is the project progressing so far? We have two years remaining until the end of the project. Until then, we must learn how much sand production can be expected that is necessary for this project. Also, we need to figure out what to do with a reclaimed road that is cutting off sand transportation to an area that has become like a lake ? currently called the lagoon ? because it has become separated from the bay. Other issues remain that still need to be figured out for it to proceed. To tackle these challenges, we need help from a wide range of persons concerned, including the government, NGO, and local residents. 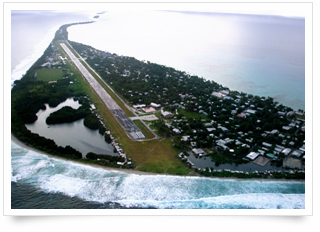 Is it difficult to conduct joint research in Tuvalu? What have you gained from it? At first, I had the image of a developing country, but when I actually began my research, the high level of education of the staff surprised me. However, the same can be said of Japan as well, but I have often felt frustrated because people here rarely take the initiative to get involved in something. In the field of research, you are required to be self-reliant and have the ability to come up with unique ideas, but the people here rarely show these qualities to me. On the other hand, it makes me really happy when they express their own ideas to me with a shy smile. I may have learned the value of the "shy smile" ? although my fellow researchers are all mature adults in their 20s and 30s. I don't think many Japanese people are familiar with Tuvalu. What do you think should be done to share their problems with the people in Japan? Just arrived for research at a small island in the atoll. The moment just before landing is infused with an atmosphere of both tension and a high sense of motivation.As you say, not many people in Japan appreciate Tuvalu's circumstances. Even I used to think of Tuvalu's issues as being largely self-inflicted because people had built homes on vulnerable land (marshy land). However, the horrific tsunami that accompanied the Great East Japan Earthquake in March 2011 made me realize that we do the same thing in Japan, expanding our cities and building homes on low-lying alluvial land that is vulnerable to calamities that come from the sea. With my new understanding of how we share similar concerns, I am keen to give as many people as possible the opportunity to learn more about Tuvalu. For that reason, we hosted a study tour in March 2012, the first attempt of its kind. Some of the comments received from the participants are: "By learning about the people of Tuvalu, I learned about the problems of climate change and social-economic issues, and above all, I was impressed by the smiles of the people of Tuvalu"; and "With this tour, I gained an understanding of a variety of things about Tuvalu that I was unable to grasp just from information from the media." So, little by little, I think we were able to share an understanding of the issues with people who were formerly not familiar with Tuvalu. What are your future expectations for this project? In order to spread awareness about this project, a picture book was created in Tuvaluan, English, and Japanese. The story and all of the drawings were created by a member of the project.At this stage, we do not yet have an in-depth understanding of foraminifera, but I believe we will discover the details of its mechanism in the near future. If we learn its reproductive mechanism, then we will be able to breed more effectively, which will lead to better results for the project. Also, in the future, I would like to put more effort into educating people of the achievements of this project, such as by hosting workshops. These educational outreach programs will not only be for people living around the capital city in Funafuti, but also for people living on other islands. The local people have acquired measurement skills and equipment, so from now on, they can monitor the changes in their land formation and ecosystem continuously on their own! This project in Tuvalu was my first assignment as a student intern at SATREPS, and it was also my most memorable. I was only with the project for a short six months, but I would like to take this opportunity to thank everyone involved in giving me an assignment with such responsibilities. To think about the significance of SATREPS, I believe, is to also think about the ideals and possibilities of international cooperation. By working on the Tuvalu issue, I believe I was finally able to come to a personal understanding of this. Instead of simply conducting basic research in a laboratory and ending it there, we can create an international cooperative system that mutually complements each other by actually applying the research onto the field. It no longer becomes a unilateral approach. I believe that SATREPS shows a new model of international cooperation that leaps beyond the traditional structure, where those involved are not divided into the "supporter" and "supported," but where both cooperate as "counterparts." To be honest, in the beginning, I was afraid that I would not be able to serve my role because I do not have a mastery of science and technology. However, as I got involved, I felt a strong desire to make more people aware of the significance and possibilities of SATREPS by introducing them to the project in Tuvalu. I sincerely hope that some little discovery or wonder about the island of Tuvalu and foraminifera will lead to even more interest on various issues from a global perspective. * 'Research Period' indicates the period of collaboration finalized between the research institutes.